B-cell activating factor (BAFF), a member of the family of TNF-like cytokines, supports the survival and differentiation of B cells. The successful development of belimumab, a human antibody targeting soluble BAFF, has marked an important milestone in the development of biologic therapy for treatment of systemic lupus erythematosus (SLE), although much remains unknown regarding the clinical utility of BAFF inhibition in SLE and other autoimmune diseases. In the present review, we provide an overview of the knowledge concerning BAFF's role in murine and human B-cell development and maturation, as well as the clinical and mechanistic effects of BAFF inhibition in human SLE. B-cell activating factor (BAFF) and a proliferation-inducing ligand (APRIL) are homologous TNF-like cytokines that support the survival and differentiation of B cells. BAFF binds to three receptors - B-cell activating factor receptor (BAFF-R), transmembrane activator and calcium-modulator and cyclophilin ligand interactor (TACI), and B-cell maturation antigen (BCMA) - that are expressed on B cells at different developmental stages, whereas APRIL binds only to TACI and BCMA. BAFF-R is the predominant receptor on transitional, naïve, and memory B cells, TACI the predominant receptor on marginal zone and short-lived plasma cells, and BCMA the predominant receptor on long-lived plasma cells (reviewed [1–3]). BAFF overexpression leads to B-cell expansion and a lupus-like syndrome in mice, whereas BAFF inhibition delays lupus onset in spontaneous mouse models of systemic lupus erythematosus (SLE) [4–6]. These observations rapidly led to the development of therapeutics that inhibit BAFF and APRIL. The recent successful completion of two large, phase III clinical trials (BLISS-52 and BLISS-76) [7, 8] of belimumab, a human antibody targeting BAFF , and its approval for the treatment of SLE represent the first successful development of a novel biologic therapy for this disease. Moreover, clinical data regarding the effect of BAFF inhibition on B-cell subsets and serologic markers of disease activity have helped to elucidate the physiologic effects of BAFF inhibition in humans [10–12]. Enthusiasm for the use of belimumab in practice has been tempered for several reasons. In both of these phase III studies, the difference in primary outcome between standard of care and standard of care plus belimumab was modest and, in the BLISS-76 study, failed to be sustained at 76 weeks. Also, the mechanism by which belimumab benefits lupus patients is still not entirely clear, making it difficult to predict which patients will respond and how best to evaluate a therapeutic response. Finally, the expense of this new drug gives pause to prescribers and patients alike. Autoreactive B-cell receptors are generated either when random immunoglobulin variable gene rearrangement occurs in the bone marrow or as a consequence of somatic mutation that occurs mainly in the germinal centers after antigen stimulation . Transitional B cells, having exited from the bone marrow, depend both on a signal through the B-cell receptor and the interaction of BAFF with BAFF-R for their further maturation into follicular or marginal zone B cells [14, 15]. In murine lupus models, BAFF inhibition depletes these cell types while sparing early transitional B cells and B1 cells [16, 17] (Figure 1). Because developing B cells that recognize autoantigen downregulate their expression of the B-cell receptor, they are relatively more dependent on BAFF than their nonautoreactive counterparts and are more likely to be deleted when serum levels of BAFF are limiting [18, 19]. Importantly, however, not all developing autoreactive B cells are equally susceptible to BAFF inhibition and the consequence of altering BAFF availability can vary depending on the B-cell environment and the proportion of autoreactive B cells compared with nonautoreactive B cells (reviewed ). Mechanisms of action for human B-cell activating factor and a proliferation-inducing ligand inhibitors. B-cell activating factor (BAFF) and a proliferation-inducing ligand (APRIL) bind differently to the three receptors B-cell activating factor receptor (BAFF-R), transmembrane activator and calcium-modulator and cyclophilin ligand interactor (TACI), and B-cell maturation antigen (BCMA). Selective BAFF inhibitors block the interaction between soluble BAFF or both soluble and membrane BAFF and its receptors, leaving APRIL functions intact, whereas the dual BAFF/APRIL inhibitor atacicept (TACI-Ig) blocks the interaction of both BAFF and APRIL with all three receptors. 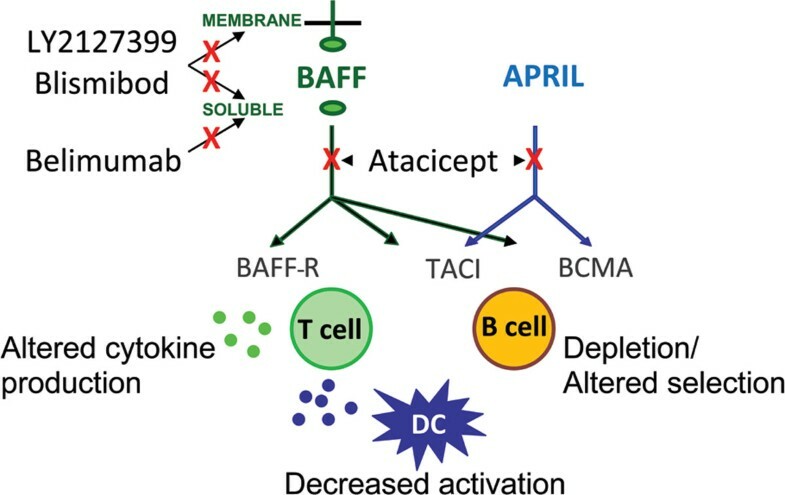 BAFF inhibition depletes B cells and alters the selection of autoreactive B cells, and may have either direct or indirect effects on T cells and dendritic cells (DC). After antigen exposure, signaling through BAFF-R is necessary for the formation of a mature follicular dendritic cell network in germinal centers and for the survival of late germinal center B cells [21–23]. BAFF signals also interact with Toll-like receptor-mediated signals by a variety of mechanisms that serve to amplify immune responses [24–28]. Although both primary and secondary IgG responses are diminished by BAFF or BAFF-R deficiency, class-switched and somatically mutated antibodies still arise after immunization . In mouse models of lupus, BAFF inhibition only modestly delays the onset of an anti-double-stranded DNA autoantibody response and these antibodies are still capable of deposition in the kidneys [16, 17]. Nevertheless, a complete absence of BAFF in a lupus-prone mouse strain skews the isotype of the glomerular IgG deposits , suggesting that BAFF may directly or indirectly play a role in the selection and maturation of germinal center and post-germinal center autoreactive B cells. Further work is needed to clarify this issue. In mice, short-term selective BAFF blockade modestly decreases the number of short-lived IgM-producing plasma cells but has no effect on long-lived plasma cells because APRIL signaling through BCMA compensates for BAFF deficiency [30, 31]. TACI-Ig that blocks both BAFF and APRIL profoundly reduces short-lived IgM-producing plasma cells and decreases the frequency of and total number of IgG-producing plasma cells in the spleen [16, 17]. IFNα administration decreases the dependence of IgG-producing but not IgM-producing plasma cells on BAFF and APRIL . While blockade of both BAFF and APRIL also decreases long-lived plasma cell survival in normal mice , bone marrow plasma cells in some strains of SLE mice are resistant to this blockade . T cells may be a source of plasma cell support in the bone marrow since combined BAFF/APRIL inhibition and CTLA4-Ig treatment decreases serum levels of IgG, whereas neither drug alone has an effect . Multiple innate and adaptive factors may thus influence the survival of plasma cells in the setting of chronic inflammation and alter their dependence on BAFF and APRIL . In humans, IgM-producing and IgA-producing plasma cells are similarly more sensitive to BAFF/APRIL blockade than are IgG-producing plasma cells [36, 37]. The mechanism for this difference, whether it is intrinsic to the switched cells themselves or to their environment, is not known. In experiments using immunization with conventional antigens, survival of murine memory B cells in vivo and of human memory B cells in vitro  was found to be independent of BAFF and APRIL signaling [16, 30, 31]. Whether there is any influence of BAFF or APRIL on selection or expansion of autoreactive memory B cells is not known. Since BAFF may collaborate with inflammatory cytokines in the reactivation of memory B cells, BAFF could conceivably play a role in memory B-cell function in inflammatory states [39, 40]. An initial phase II study of belimumab combined with standard of care therapy for treatment of SLE failed its primary endpoints - namely Safety of Estrogens in Lupus Erythematosus National Assessment (SELENA)-Systemic Lupus Erythematosus Disease Activity Index (SLEDAI) score reduction at week 24, or a reduction in the time to first SLE flare over 52 weeks . Nevertheless, the study provided valuable insights into belimumab's potential benefits and mechanism of action, and facilitated optimization of further trial design. By post-hoc analysis, time to first flare starting at week 24 through week 52 was significantly longer in the belimumab group than in the control group, suggesting that belimumab can stabilize disease but requires some time to do so. Post-hoc analysis also identified a subset of autoantibody-positive patients (antinuclear antibody titer ≥1:80 and/or anti-double-stranded DNA antibody level ≥30 IU/ml) in whom belimumab treatment was associated with significantly greater reductions in SELENA-SLEDAI scores from baseline to week 52 (-28.8% in the combined belimumab group vs. -14.2% in controls). Additional post-hoc analy sis of the phase II results led to the development of the Systemic Lupus Erythematosus Responder Index (SRI), designed to reflect improvement in disease activity without worsening of the overall condition or the development of significant disease activity in a new organ system [12, 41]. The SRI is defined as: ≥4-point reduction in the SELENA-SLEDAI score; no new British Isles Lupus Activity Group A domain score or no more than one new British Isles Lupus Activity Group B domain score; and no deterioration from baseline in the physician's global assessment ≥0.3 points. When the SRI was retrospectively applied to the phase II trial, belimumab treatment resulted in a significantly larger percentage of responders than standard of care alone (46% vs. 29%, P = 0.006) (Table 1). SRI, Systemic Lupus Erythematosus Responder Index. Using the SRI response rate at 52 weeks as their primary endpoint, both the BLISS-52  and BLISS-76  trials demonstrated a significantly better response to belimumab plus standard therapy versus standard therapy alone in serologically active patients with moderately active SLE. In the BLISS-52 study, the SRI response rate was 58% for 10 mg/kg belimumab and 51% for 1 mg/kg belimumab, compared with 44% in the controls. In the BLISS-76 study, belimumab at 10 mg/kg met the primary efficacy endpoint at week 52, with an SRI response rate of 43.3% compared with 33.5% in controls. The response to 1 mg/kg belimumab in the BLISS-76 trial was not statistically significant. In the BLISS-76 trial, the SRI response rate was numerically higher with belimumab than in controls at week 76, but the differences were no longer statistically significant. Nevertheless a post-hoc analysis that applied a more stringent reduction in the SELENA-SLEDAI score revealed significant differences between the belimumab and control groups at several times between week 40 and week 76. The trial's ability to discriminate between doses was possibly compromised at week 76 due to a 7% dropout rate in each patient group between weeks 52 and 76 or due to more liberal prednisone use in the control group. Steroid-sparing effects were also observed in the two phase III trials. In the BLISS-52 study, greater proportions of patients receiving 10 mg/kg belimumab were able to reduce their prednisone dose by >50% (28% vs. 18% in controls, P = 0.0122) and fewer needed to increase their prednisone dose; consequently, the total prednisone dose was significantly higher in the controls from weeks 12 to 52. In the BLISS-76 study, similar trends were observed although the differences did not reach statistical significance. Reductions in flares were also observed in both phase III trials. In the BLISS-52 trial, for patients treated with 10 mg/kg belimumab the time to first flare was significantly increased and the risk of developing a severe flare during 52 weeks was reduced by 40 to 50%, compared with the control group. There were similar trends in the BLISS-76 trial, but significance was only achieved in the 1 mg/kg belimumab group. The mechanistic data from clinical trials of belimumab have been mostly consistent with murine studies, although the physiologic response lags several weeks behind the rapid response in mice. In human subjects with SLE, belimumab treatment led to a significant decrease in naïve and transitional CD27- B-cell subsets, in the CD27+/IgM+ subset that includes the marginal zone B-cell subpopulation, and in the IgD-/CD27- population, a heterogeneous population that accumulates in SLE patients and contains both naïve and memory B cells. Class-switched CD27+ memory B cells were not decreased even after several years of treatment. Only a very modest decrease in plasma cells was observed after 1 year, predominantly accounted for by a decrease in IgM-producing plasma cells [10, 12]. Pooled data from the BLISS-52 and BLISS-76 trials have been analyzed for changes in autoantibodies, immunoglobulin, and complement, and BLISS-76 patients were analyzed for changes in B-cell and T-cell populations and effects on prior vaccine-induced antibody levels [11, 42]. Results of these analyses are summarized below. In the BLISS-76 trial, belimumab treatment did not decrease T cells - but total B cells declined by 55% over the course of the study, with the most significant decline in the naïve B-cell subset (-76.3% vs. 3.4% in controls). There was an initial doubling of the CD20+/CD27+ subset that includes memory B cells and human B1 cells [43–45] at 8 weeks of treatment, which then slowly returned to normal; this may be secondary to the release of memory B cells from secondary lymphoid organs or to expansion of the memory pool, or even the B1 cell pool, as a homeostatic response to B-cell depletion - although it is important to note that the effect of belimumab on B1 cells in humans has not been examined and is currently unknown. There was a modest decrease in activated B cells (-49.1% vs. -25.2% in controls) that became significant at week 52. Plasmablasts were evaluated using either CD138 or CD27, which identify overlapping plasmablast subsets . Fully differentiated plasma cells are rare in the circulation and cannot be readily evaluated using flow cytometric analysis of peripheral blood. Plasmablast frequency and number declined by week 8 and then stabilized for the rest of the study. This early decline might reflect a resetting of the plasmablast number due to the decrease in BAFF availability, leaving only APRIL to maintain homeostasis. Alternatively, a decrease in the number of B cells, a change in the kinetics of plasmablast production, maturation or traffic, or a decrease in disease activity could all contribute. Since correlation of declining plasmablast number with total immunoglobulin or autoantibody levels was not performed, the physiologic significance of this finding is not yet known. Additionally, one should stress that changes in B-cell subsets have not been correlated with clinical response. Belimumab induced a modest ≤15% decrease in total IgG levels by week 8 of treatment that persisted through week 52. More significant decreases were noted in serum levels of IgA (~17%) and IgM (~30%) with no change in the controls. In both trials, improvement of complement levels was observed as early as 4 weeks after starting therapy and continued throughout the trial. In the BLISS-76 study, 51% of treated patients with low serum complement levels at baseline had normalized their complement levels by week 76. Although more patients in the belimumab group converted from positive to negative titers of anti-DNA antibodies, most converters had initially low titers of antibodies (30 to 99 IU/ml) with virtually no conversions in patients with higher auto-antibody titers. When data from the two phase III trials were pooled there was a median percentage change in anti-DNA titers of 40.8% compared with 10.2% in the controls, with changes observed as early as week 8. The physiologic meaning of this change is unclear since the number of patients with only low titers at baseline was not reported. Conversions from positive to negative were also noted for other autoantibody specificities including Sm, ribosomal P, and cardiolipin, although initial titers of antibodies were not reported. A post-hoc analysis of pooled data from the BLISS-52 and BLISS-76 trials was performed to investigate whether clinical response correlated with biomarkers of disease. There was no correlation of baseline BAFF levels with SRI response at week 52 irrespective of therapy, showing that BAFF levels cannot be used to select patients for treatment. Those patients who had low C3 or C4 and positive titers of anti-DNA antibodies at baseline had significantly higher SRI response rates with belimumab 1 mg/kg (41.5%, P = 0.002) and 10 mg/kg (51.5%, P <0.002) than with standard of care alone (31.7%) and a decreased risk of severe flare. However, hypocomplementemia and anti-DNA antibodies are common features of active lupus, and thus the clinical applicability of this finding will probably be limited. Furthermore, among only belimumab-treated patients, modified SRI response rates were significantly greater in those with normalization of C4 at week 4 than in those without normalization (56% vs. 44%, P = 0.02). Normalization of C3 at weeks 4 and 8 was also associated with a significantly lower risk of severe flare irrespective of therapy, but these differences were not significant when the belimumabtreated group was examined on its own. Similarly, a decrease in anti-DNA titers at week 8 was not significantly associated with a decrease in the risk of severe flare. Patients with normalization of IgG after week 24 had significantly greater SRI response rates than patients without normalization, irrespective of treatment. These data, in sum, suggest that serologic responses are associated with a better outcome, as expected, but that only the C4 level appears to be a potential early biomarker for those patients more likely to respond to belimumab. Nevertheless, the clinical utility of C4 as a biomarker for response to belimumab may be limited, given the relatively small difference in rates of SRI response between C4 normalizers and non-normalizers and the relatively narrow range of C4 levels encountered in clinical practice. In the BLISS-76 trial, changes in B-cell and plasma cell subsets over 52 weeks were evaluated for correlations with SRI response or reduction in flares. Only the naïve B-cell subset showed a consistent association of greater percentage reduction from baseline with greater likelihood of SRI response at week 52 (60.2% vs. 46.0% SRI response rate with >70% vs. <70% reduction, P = 0.002) and lower risk of severe flare over 52 weeks. This analysis held true irrespective of therapy, so the role of belimumab is unclear. Nevertheless, since B-cell depletion >70% occurred more often in the belimumab group than in controls, the data suggest possible differences in pharmaco kinetics of the drug between patients. We conclude from these findings that currently there appear to be no effective biomarkers for the identification of individual patients who are likely to respond to belimumab therapy. Effects on pre-existing vaccine antigen-specific antibody levels were assessed in BLISS-76 patients who had received pneumococcal or tetanus vaccine within 5 years of the start of treatment. At week 52 there were no significant differences across treatment groups in the percentages of patients maintaining anti-pneumococcal IgG titers to five serotypes that cause frequent drug-resistant pneumococcal infections in the United States. Similarly, anti-tetanus toxin IgG titers and anti-influenza titers were not significantly decreased . In the BLISS-76 trial, one patient in each treatment group had a grade 3 reduction in total serum IgG (IgG <4 g/l), which was not associated with infection. These data are consistent with those from the mouse studies that showed no effect of BAFF inhibition on long-lived class switched plasma cells. In both the BLISS-52 and BLISS-76 trials, the incidence of adverse events - including laboratory abnormalities, serious infections, and malignancies - was similar in the treated and control groups. In the BLISS-76 study, infusion reactions were more common with belimumab than in controls (14 to 16% vs. 10%) but all resolved with antihistamine and/or prednisone treatment on the day of the infusion. Five pregnancies occurred in patients receiving belimumab. Three of these pregnancies resulted in normal live births, one in elective termination, and one patient was lost to follow up. Several suicides were noted in the belimumab group but it is not clear whether these were drug related. Much remains unknown regarding the clinical utility of BAFF inhibition in SLE. The BLISS-52 and BLISS-76 trials were not powered to compare belimumab treatment against the background of different immunosuppressive therapies. Additionally, some patient subpopulations were not evaluated - notably pediatric patients and patients with active lupus nephritis or cerebritis. Some of these issues are being addressed in ongoing studies. Given the time it takes to observe a therapeutic effect with belimumab, it is not a suitable intervention for acute severe flares. Whether belimumab should be used to prevent flares or as a steroid-sparing agent for patients with moderate disease activity remains to be determined in longer term studies. Determining the duration of the therapeutic effect is critical, because the observed reduction in number and severity of flares and a decreased overall steroid dose even at 76 weeks could all contribute to significant long-term benefits. Notably, the manufacturers do not recommend the as yet unevaluated use of belimumab following treatment with either cyclophosphamide or rituximab. Nevertheless, inhibiting BAFF after cyclophosphamide or rituximab treatment could potentially reverse the adverse effects of B-cell depletion on selection of naïve autoreactive B cells. The safety of this strategy remains to be evaluated. Further mechanistic studies may identify biomarkers for a therapeutic response and may help determine which patients are most likely to benefit from belimumab treatment. Other strategies for inhibiting BAFF are available. Atacicept (a nonselective antagonist of both BAFF and APRIL) is in trial for the treatment of moderately active SLE. Tabalumab (LY2127399), an alternate anti-BAFF antibody, and blisibimod, a small BAFF-R-derived peptide, both of which block both soluble and membrane BAFF (in contrast to belimumab, which blocks only soluble BAFF), are similarly being tested in SLE  - and whether there is a benefit of blocking both BAFF and APRIL or of blocking all BAFF forms over blocking soluble BAFF alone remains to be determined. Selective APRIL blockade has demonstrated very modest preventive effects in NZB/W mice, delaying proteinuria, kidney damage, and mortality by approximately 4 weeks, and with limited effects on B-cell kinetics or autoantibody titers . APRIL-/- NZM2328 mice have clinically identical disease to wild-type NZM2328 mice, confirming that APRIL is minimally involved in disease development . Selective APRIL inhibition is unlikely to be tested in human SLE. BAFF overexpression has been detected in the brains of mice and patients with multiple sclerosis, and atacicept had a beneficial effect in a mouse model of multiple sclerosis. However, a phase II study of atacicept for multiple sclerosis had to be terminated because of disease worsening . IFNβ is standard treatment for multiple sclerosis and increases serum BAFF levels in multiple sclerosis patients . Whether the negative effect of atacicept was due to a decrease in type I interferon or an alteration in other cytokines has not been determined. Data from animal and human studies suggests that BAFF inhibition could have therapeutic effects beyond its primary effect on B cells. BAFF supports the survival of monocytes and enhances their differentiation into macrophages . Human myeloid dendritic cells stimulated with BAFF in vitro upregulate co-stimulatory molecules, lose their phagocytic ability, and produce inflammatory cytokines . This effect may be due to interaction with dendritic cell-expressed TACI. T-cell production of IFNγ is supported by the interaction of BAFF with BAFF-R on the surface of activated T cells; T cells from SLE patients produce more IFNγ in response to BAFF than do T cells from normal individuals . In a mouse model of arthritis, synovial dendritic cells transduced with a siRNA that silences BAFF remained in an immature state and failed to produce the IL-6 required for the differentiation of T-helper type 17 cells . Peripheral monocytes from patients with Sjögren's syndrome produce significantly higher amounts of BAFF and IL-6 in comparison with normal monocytes, and this difference is partially suppressed by an anti-BAFF anti body [55, 56]. Furthermore, salivary epithelial cells from Sjögren's syndrome patients can be induced by type I interferon to express BAFF . BAFF can also bind to basophils, although the role of this interaction is still unknown . More work must be done to elucidate the role of BAFF inhibition in regulating the contributions of these non-immune B-cell types to autoantibody-initiated tissue inflammation, and to autoimmunity in general. Likewise, a better understanding of BAFF and APRIL and their varied contributions to both innate and adaptive immune system function holds promise for more effective and specific targeting of BAFF for the treatment of autoimmune diseases. BAFF is a member of a family of TNF-like cytokines that have a number of immunoregulatory effects, including supporting the survival and differentiation of B cells. The successful development of belimumab, a human antibody targeting soluble BAFF, has marked an important milestone in the development of biologic therapy for treatment of SLE. In two large, phase III trials of belimumab combined with standard therapy, treated patients had a better outcome at 1 year than patients treated with standard therapy alone, including a difference in the number of patients achieving the SRI, a reduction in the risk of flares and severe flares, and an overall reduction in prednisone use. In groups of belimumab-treated patients, clinical improvements were accompanied by significant and sustained improvements in measures of serologic activity compared with placebo-treated patients. However, monitoring for response to belimumab therapy in individual patients remains problematic. It is not clear whether any therapeutic effect of belimumab is maintained beyond week 76. Data from clinical trials of belimumab demonstrate similarity between the mechanistic effects of BAFF inhibition on murine and human B-cell populations. Other drugs targeting both soluble and membrane BAFF and both BAFF and the homologous molecule APRIL are currently undergoing clinical trials. Much remains unknown regarding the clinical utility of BAFF inhibition in SLE and other autoimmune diseases (Table 2). APRIL, a proliferation-inducing ligand; BAFF, B-cell activating factor; SLE, systemic lupus erythematosus.